Ruby Valley Trek is hidden in between the famous trekking areas of Langtang National Park and Manaslu Area Conservation. It is one of the untouched trekking routes inviting only a few trekkers. This trekking route serves the visitors with the diverse geographical condition, biodiversity, and culture. The Ruby Valley Trek is a great option to cherish in the beauty of the pristine nature while allowing the trekkers to observe the unique culture of the inhabitants in the trekking routes. Our trek to Ruby Valley starts with a scenic drive from Kathmandu to Sybrubensi. The trail ascends through dense forests of rhododendron, hot springs beautiful waterfalls, the Kalo Seto Kunda and numerous viewpoints. The beautiful jaw-dropping views of Ganesh and Manaslu Himal ranges can be seen from this region. Ruby Valley is dominated by Gurung, Ghale, and Kami in the north whereas Brahmin, Chhetri, Newar, and Chepang in the south offering a diverse culture of different ethnic groups. 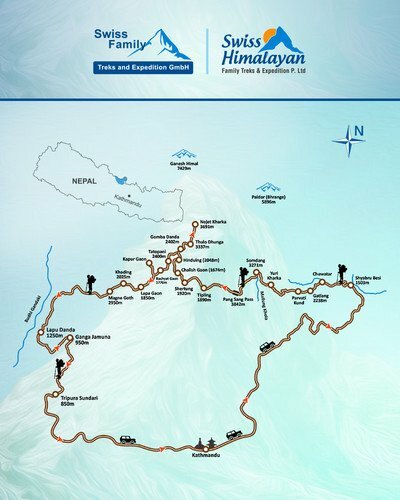 This trekking route ensures the trekkers with a lifetime unforgettable experience. It is the best-suited trekking routes for the trekkers searching the unexplored and least crowded route near to Kathmandu and Pokhara. One will get chance to enjoy the views of Ganga Jamuna, twin cascades, Kalo, Seto, and Ganesh Kunda, hot springs, and Tripurasundari. 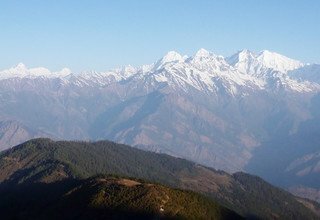 Ganesh Himal Trekking has many trekking routes but this is the best and untouched route serving with beautiful Himalayan views. The tantalizing Himalayas, undulating rivers, unique heritage and serene routes along the trek make it one of the most exciting trekking adventures in Nepal. Swiss Family Treks and Expedition is one of the best travel agencies in Nepal which has been operating in the forefront of the travel and tourism in for more than 15 years. We have an experienced team in tourism serving our clients with all the requirements they need. We offer excellent transportation and accommodation services along with fluent English-speaking guides to help you throughout your journey. On your arrival at the Tribhuvan International airport one of our airport representatives will pick you up and he/she will transfer you to the Hotel. Overnight at a 3-star hotel. As our trek starts from Sybrubensi, we will drive in a private vehicle. A six to seven hours of the drive along the winding roads crossing few settlements like Trishuli Bazaar, Ramche Gaon and Dhunche Bazaar, we will reach the beautiful village, Sybrubensi. It is the gateway of Langtang National Park and is the junction of two major rivers, the Bhote Koshi River, and the Langtang River. Overnight in a tented camp. We will trek from Sybrubensi to Gatlang through Chawatar. The trail ascends through the dusty and winding motor road to Chawatar and then to Gatlang. Gatlang is a very popular village in Tamang Heritage Trail. The main inhabitants of this village are the Tamang ethnic group and they have very unique customs and lifestyle. Overnight in a tented camp. Parvati Kunda is situated just above Gatlang. We will start to climb uphill reaching the famous sacred Kunda which draws many pilgrims during Janai Purnima. From here, the trail continues along the pine and rhododendron forests leading us to Yuri Kharka. After resting for a while, we follow the trail that continues to Khurphu Bhanjyang and then descends to Somdang River. Overnight in Somdang. Overnight in a tented camp. A short day walk from Somdang village will take us to Pangsang Pass. 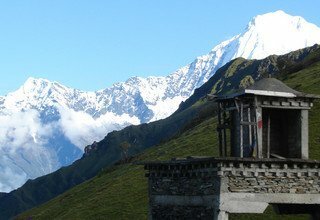 It is the best viewpoint for enjoying the beautiful panoramic views of Manaslu and Ganesh Himal range. We can see the beautiful Ganesh Himal (7422m). In the ancient days, the region was a used to trade herbs and cattle to Tibet. Few lodges are being built at Pangsang Pass but we will stay in our tented camp for the night. Today, we will descend to Tipling from Pangsang. We cross the Pangsang pass (3830m) and reach Pansan Kharka which is a pastureland for the local cattle herders. The trail continues along the rocky ridge until it crosses Adha Khola. From here we will ascend to the sister villages named Shertung and Chalise Gaon. Overnight in a tented camp. It will be a short four to five hours of a trek to Hindung village also known as Gomba Danda. We will walk the entirety of the trek along the Tatopani Khola while enjoying the lush green hills and mountain peaks in the distant horizon. Local people of this region collect Yarsagumba (a medicinal herb) at the highlands of Hindung. Overnight in a tented camp. Today will also be a short day hike continuing through steep uphill with the beautiful views of the mountains of this region. The trail continues through the seasonal meadow lands used for grazing the cattle by the locals which open to a huge open green field. It is the best-suited place for camping. Overnight at Thulo Dhunga in a tented camp. Today we will explore the valley beginning with an ascent to Dorba Danda from where we can clearly view the Ganesh Himal (7422m). The mesmerizing view is unforgettable. We will see the Seto Kunda and the Kalo Kunda situated at the base of the Himalaya. This Kunda is supposed to have mystical powers and it is believed that trekkers are blessed by these Kunda. We will descend back to Thulo Dhunga. Overnight in a tented camp. The trek retraces the same path along the jungle. The beautiful mountains surrounding us from each side are sure to fascinate us throughout the trek. The incredible biodiversity of the region is amazing and will awe us as we make the descent to Hindung. We will be welcomed by the Pasang Dolma Gate on our return to Hindung. Overnight in a tented camp. Our trail passes through a hot spring where we will take a refreshing short bath and continues along the stone paved staircases build by the British Gurkhas of Nepal. We will cross Tirgaon on our way to Richetgaon. The trek today takes us along gorgeous hills and lush vegetation to finally lead us to Richetgaon. Overnight in a tented camp. Today our trail continues from Richetgaon. 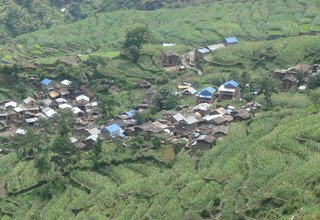 It is a small Gurung settlement with about 30 houses. The trail continues along the farmlands of rice and barley to Lapa Gaon which is the largest Gurung village in this region. Kapur Gaon is situated just above the Lapa Gaon. On reaching the Kapur Goan, we can enjoy the locals dancing on their cultural song and can have the typical meal prepared by the Gurungs. Overnight in a tented camp. Magne Goth is the famous place for ruby extraction. Our trail today ascends uphill through the dense and verdant rhododendron forest leading us to Magne Goth which is situated at the height of 2936m. Following a relatively shorter trek, we can explore the area and visit the areas around the extraction site too. Overnight at a tented camp. Today after crossing the Magne Goth we will enter Gorkha District. 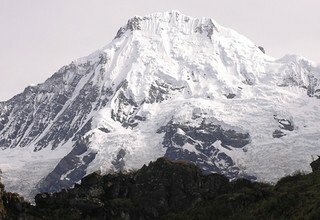 The trail descends steeply to the Chote Khola and from there climbs to the forested landscapes with the beautiful mountain views of Manaslu Himal (8163m). We will cross many small settlements like Dhonjet, Kartunje, and Manbu. After crossing the Manbu village we will re-enter to the Dhading district where the Lapu Danda is situated. Overnight in a lodge. We can enjoy the magnificent views of Himalchuli (7853m), Shringi peaks, and the Ganesh Range. We will continue to ascend through the trail passing along the farmlands of Besari. The beautiful mountains can be seen along our way. The trail continues up to the twin waterfall Ganga and Jamuna. Overnight in a tented camp. Today will be our last day of trekking and we will continue along the trail descending gradually through the farmlands, small settlements, and a few waterfalls to reach Tripura Sundari. We will cross the beautiful Akhu River before entering the Tripura Sundari. We can reflect upon the successful completion of the trek on the final day. Overnight in a tented camp. Today we will drive back to Kathmandu enjoying the last views of Manaslu range. Along five to six hours of a drive will take us to the Kathmandu. On reaching Kathmandu we will transfer you to the hotel. You can either rest or shop for gifts and souvenirs in the local marketplaces. Overnight at a 3-star hotel in Kathmandu. We will drive you back to Tribhuvan International airport for your scheduled flight to your next destination. * 2 nights accommodation in twin bed sharing basis with breakfast at 3*** hotel in Kathmandu.